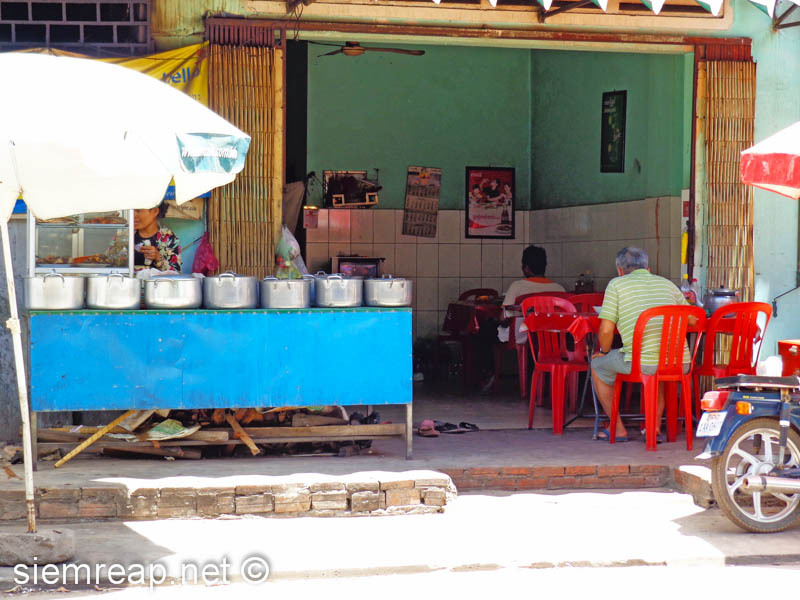 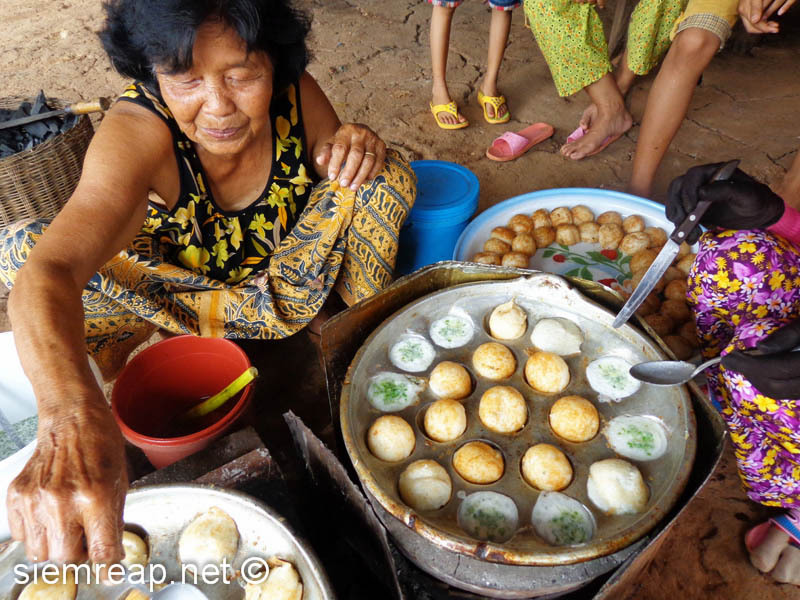 Tourists may think that fried spiders and other bugs are the only street food in Cambodia, but Cambodian street food is much more varied than that and it’s the way most Khmer people eat. 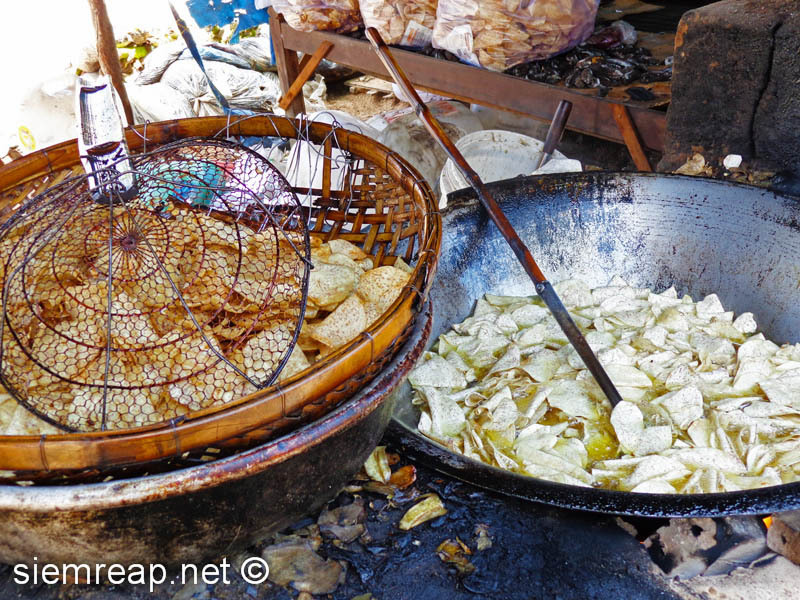 Street food is cheap, tasty and fresh, as everything is cooked in front of you. 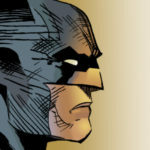 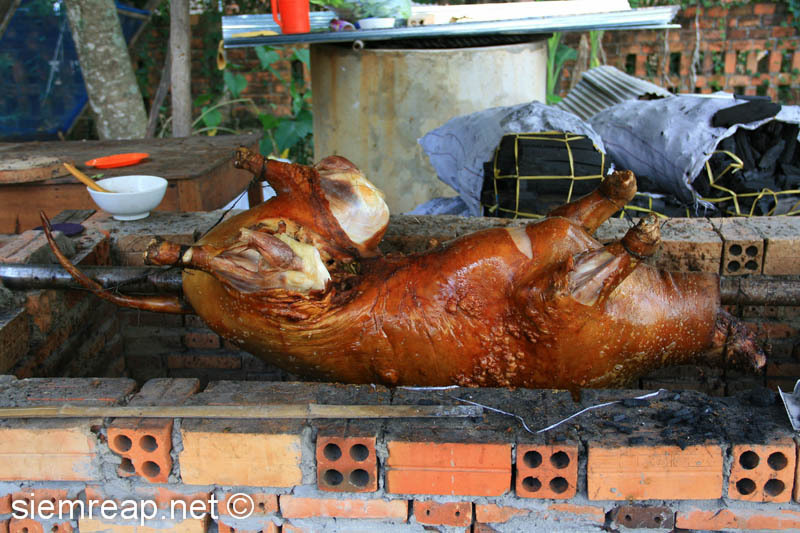 Are you worried about the hygiene? 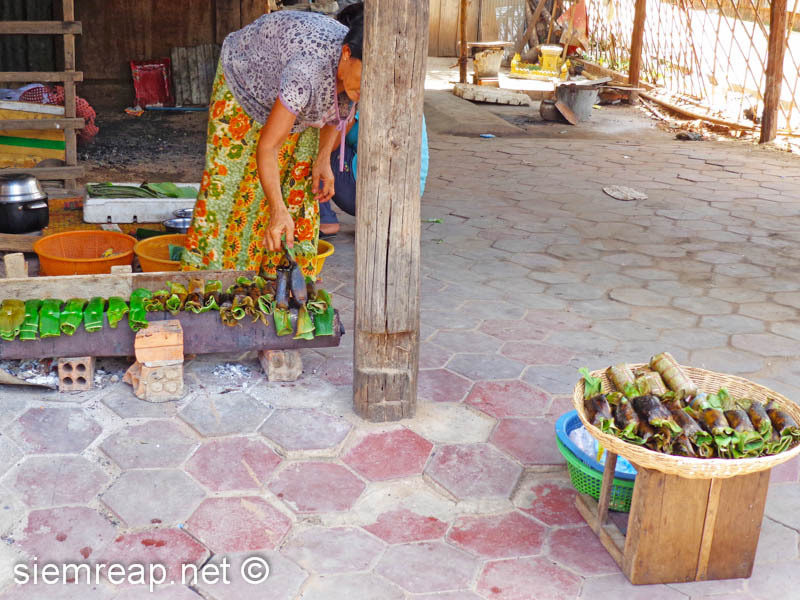 There is obviously no refrigerator, but the dishes are gone in less than an hour, and they are constantly preparing new ones. 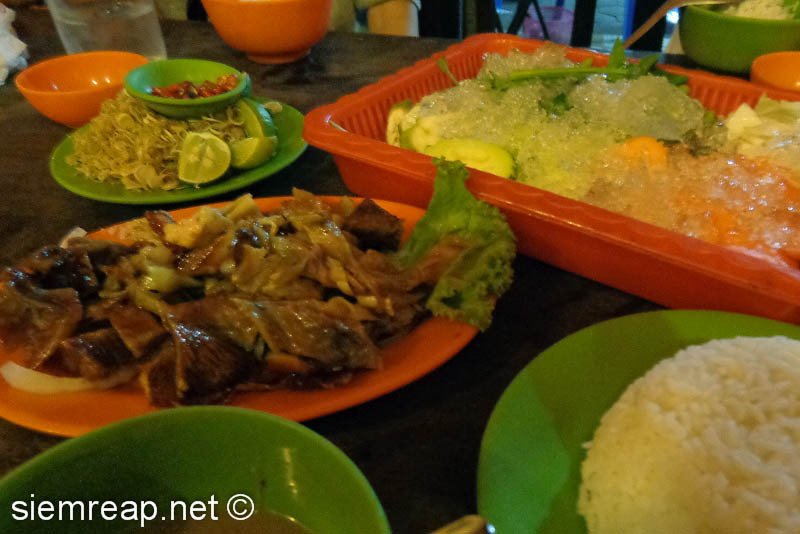 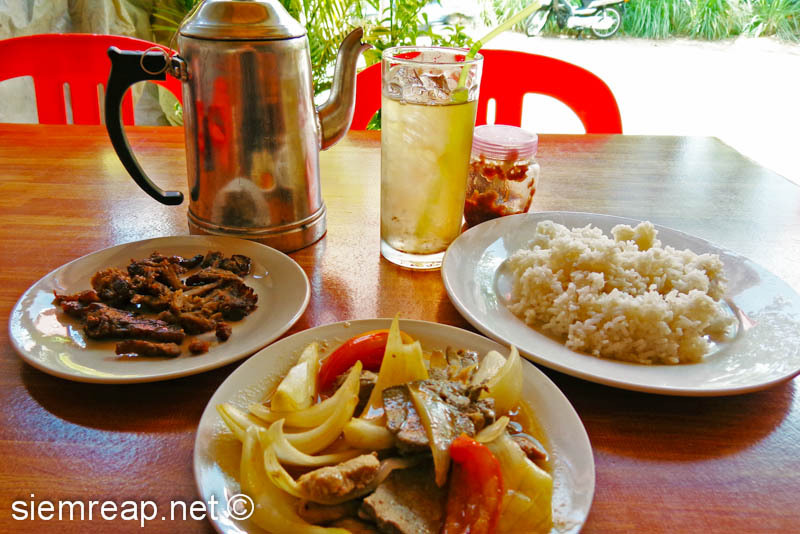 You definitively have to try some, in this post we will give examples of delicious appetizers that you will be able to find in the streets of Siem Reap at affordable prices. 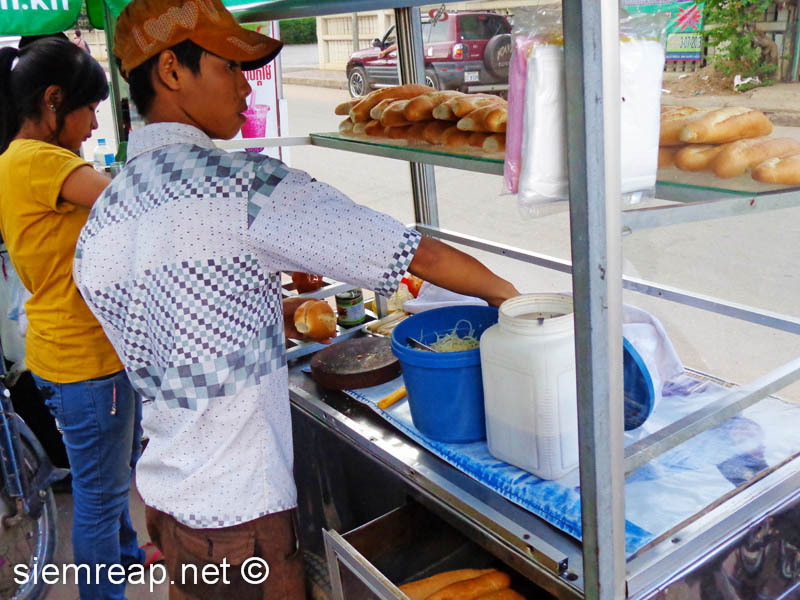 Discover and share with us your pictures of Cambodian street food stalls in this mouthwatering topic! 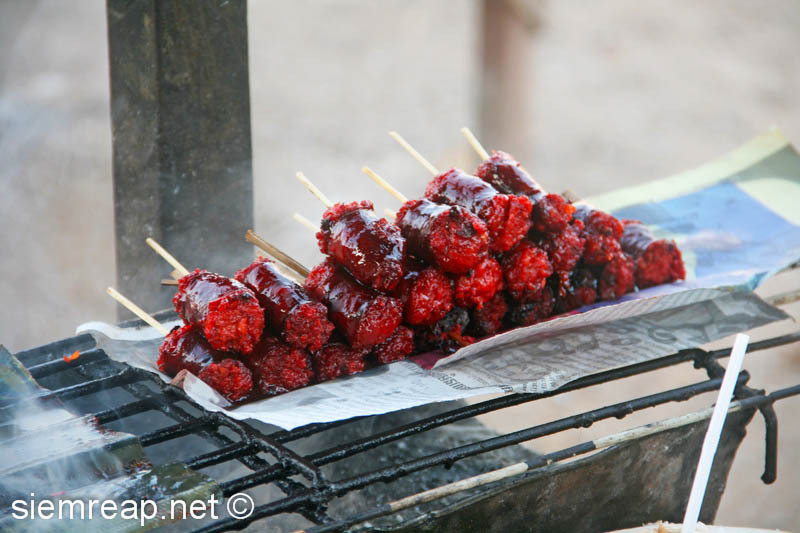 Beef Sausages (“Sacrok Ko” in Khmer) on BBQ. 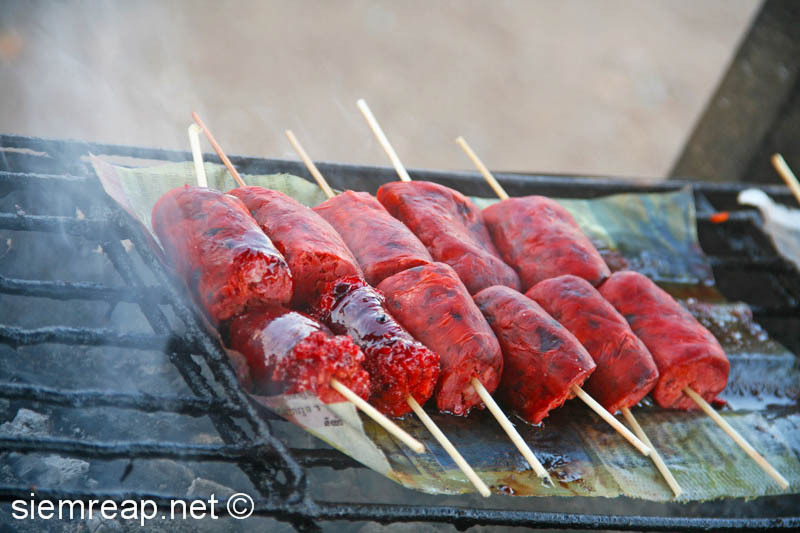 The red color comes from the spices mixed with the meat during the sausage preparation. 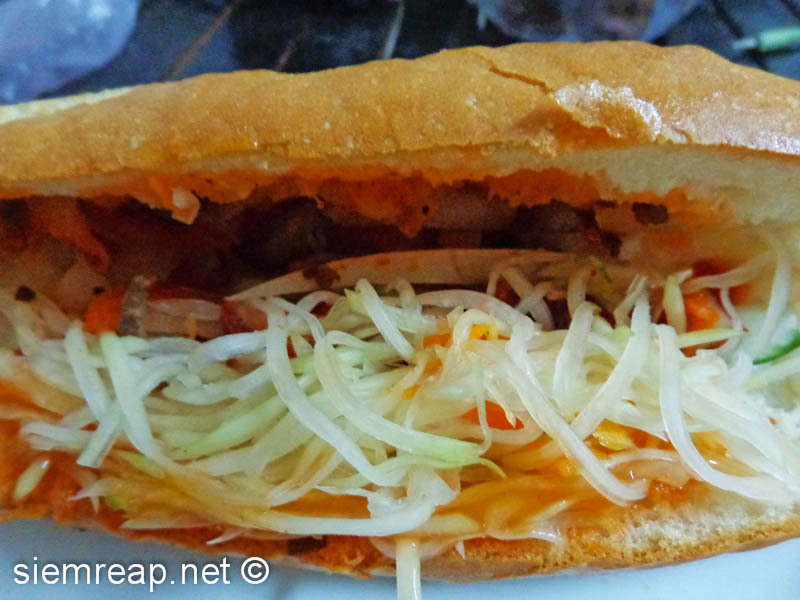 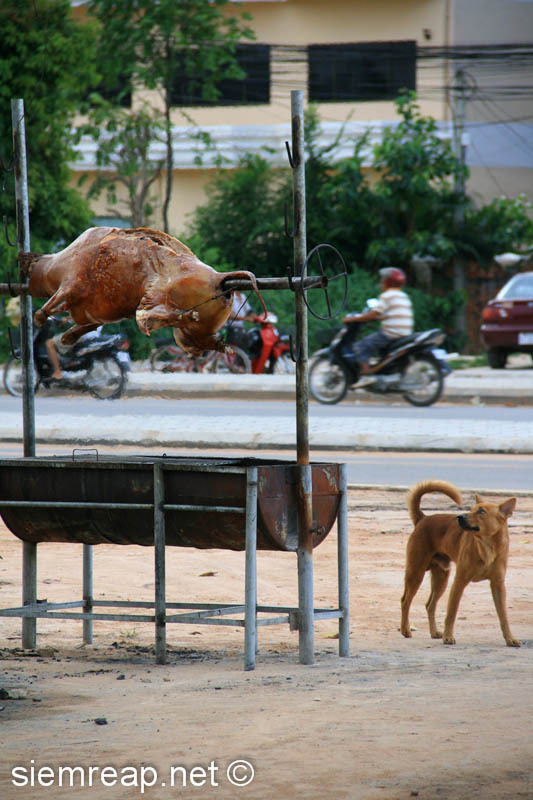 They are normally served with a papaya salad (“Tchroua Lohong”) and cost 500 riels a piece. 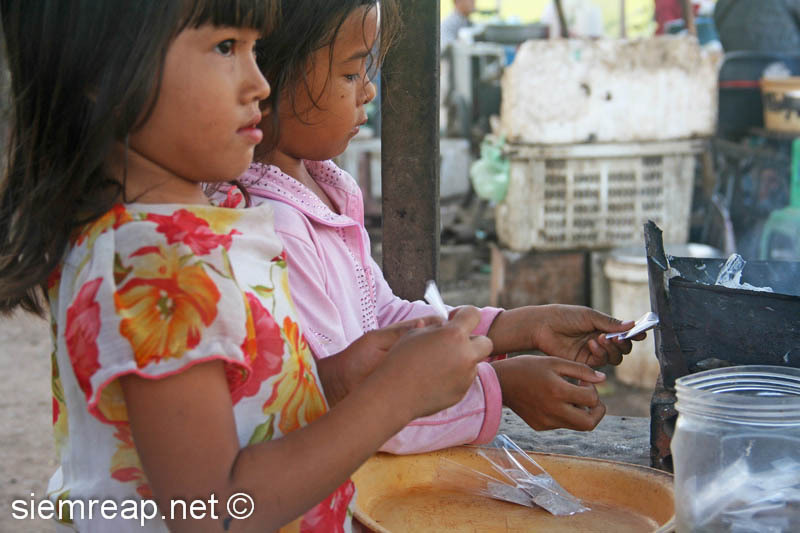 Young girls preparing salt and pepper bags, closing it by cauterization on the grill. 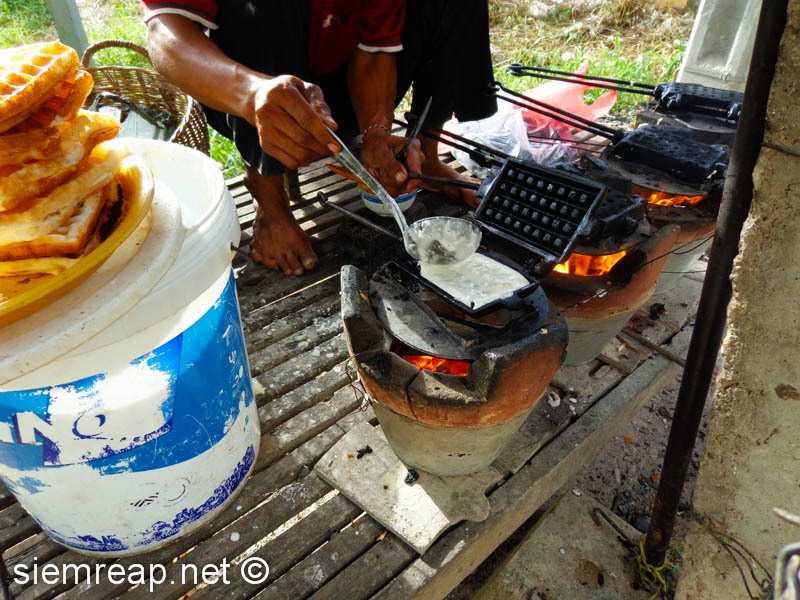 Simple and ingenious isn’t it? 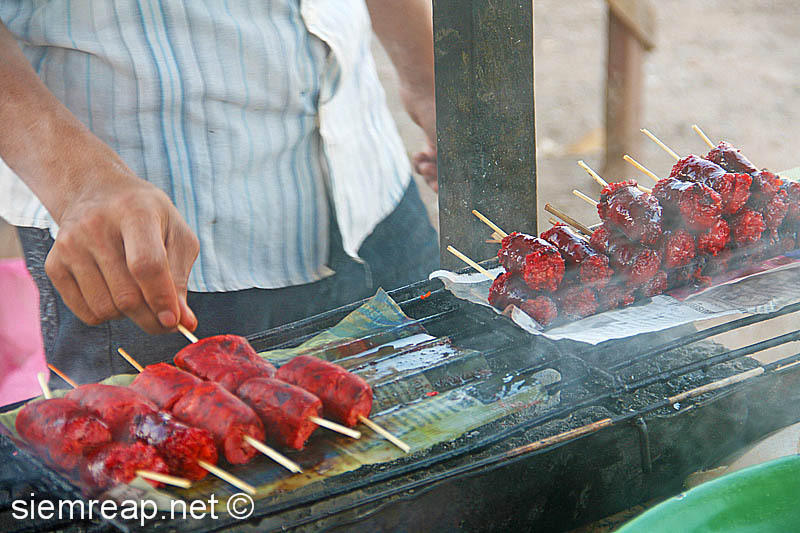 Chicken skewers (“Sak mouan an”) or other small birds, costs between $2.5 and $6 for a whole chicken. 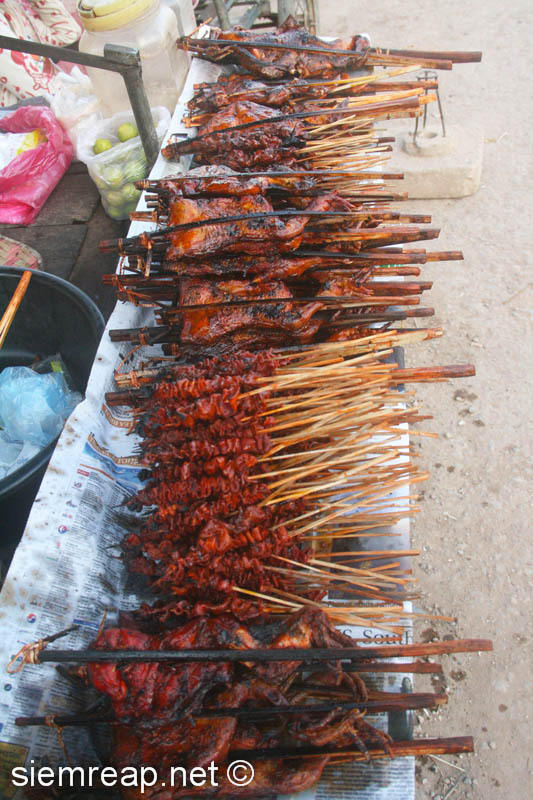 Delicious too, the small skewers of liver or gizzard (“Kor thlam mouan”), around 1000 riel each. 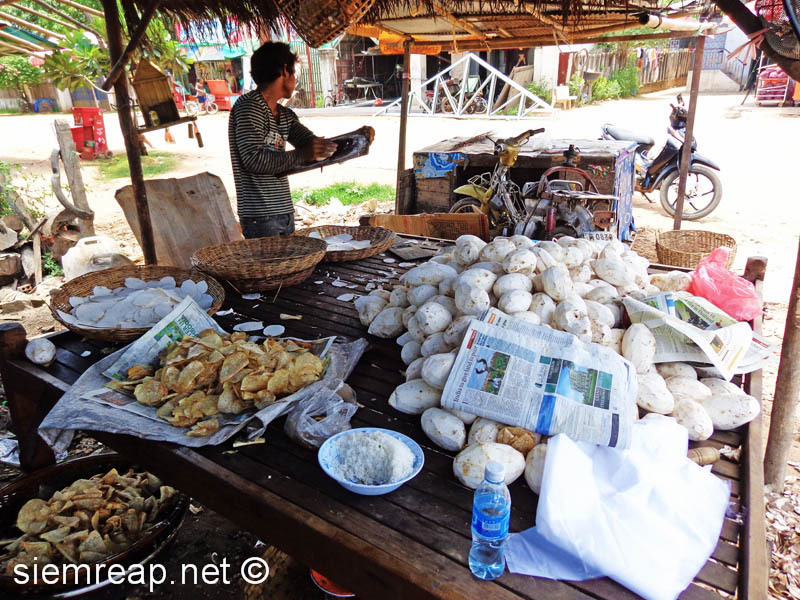 Small river shells seasoned with chili powder, salt, sugar, pepper and “cooked” in the sun. 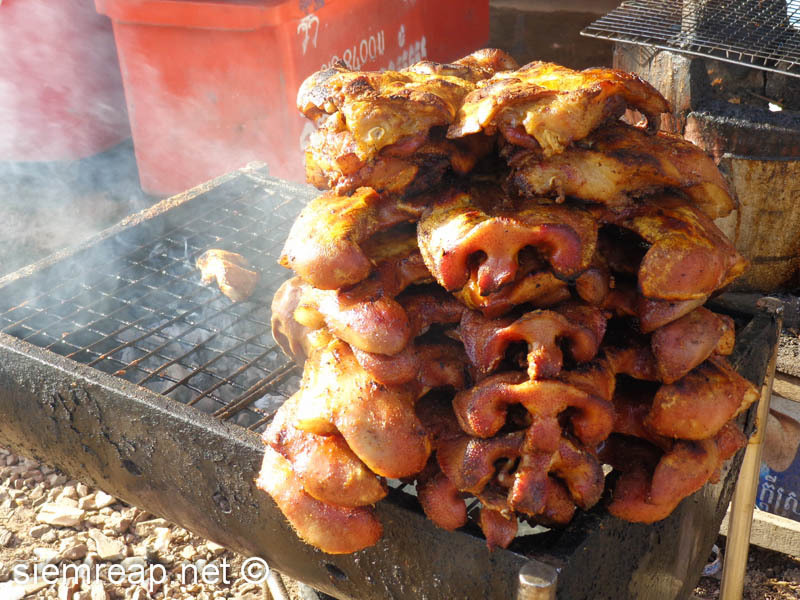 Khmer people call it “Leah hal” and a quantity as shown in the picture will cost you around 2000 riel. 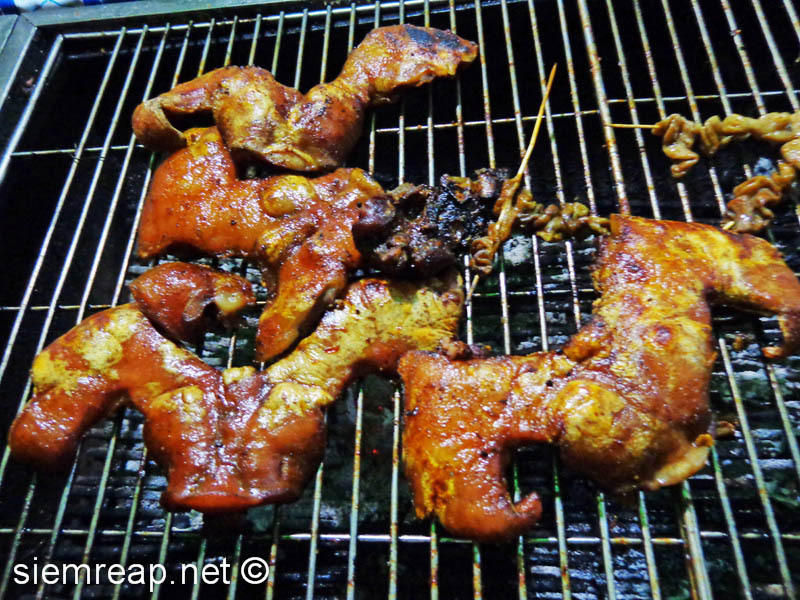 Be careful, this might be very spicy!!! 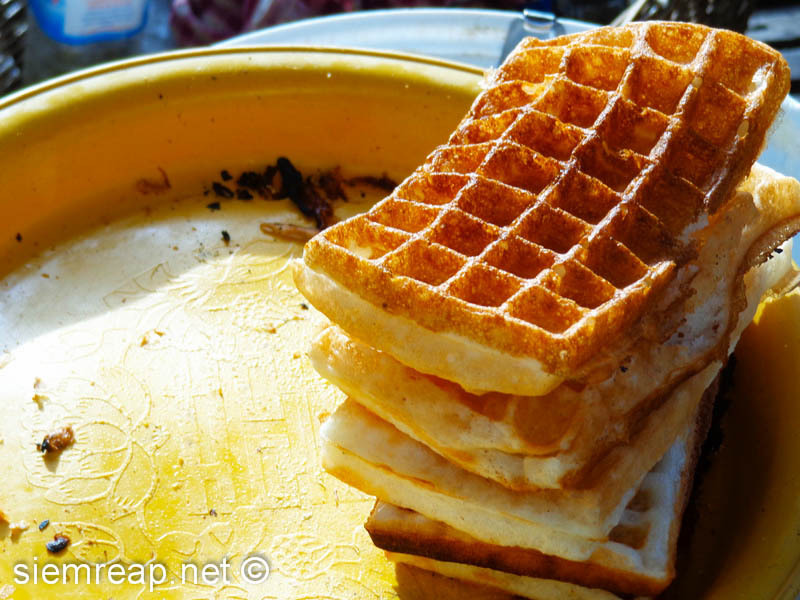 Do you like waffles? 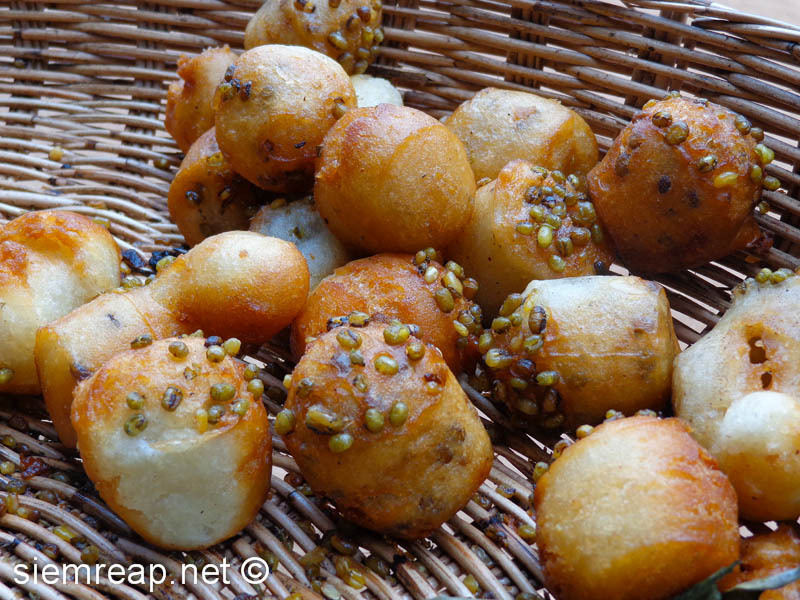 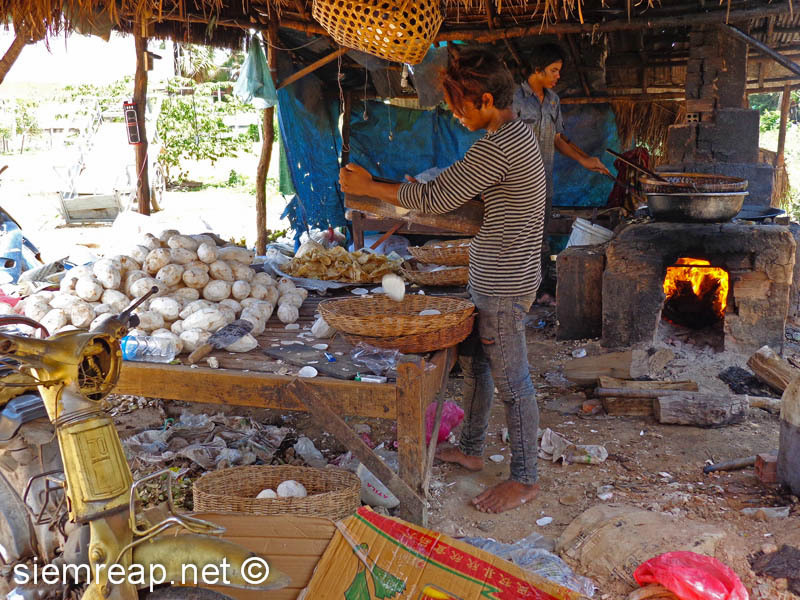 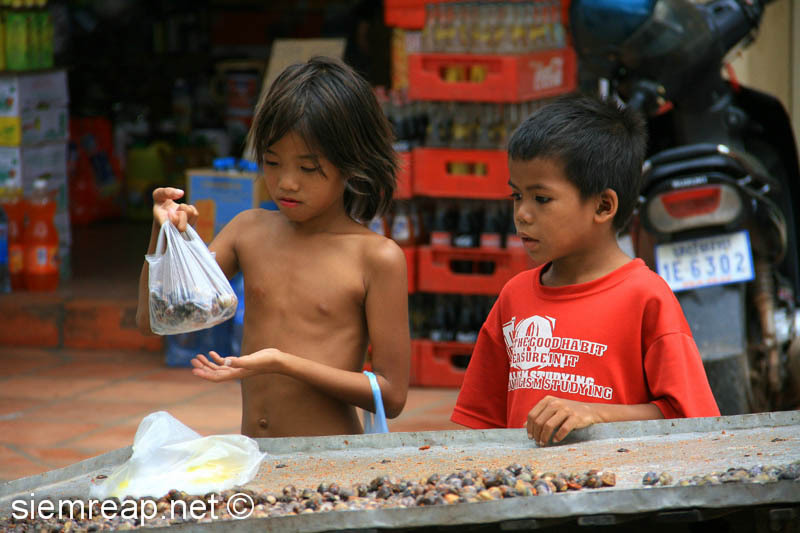 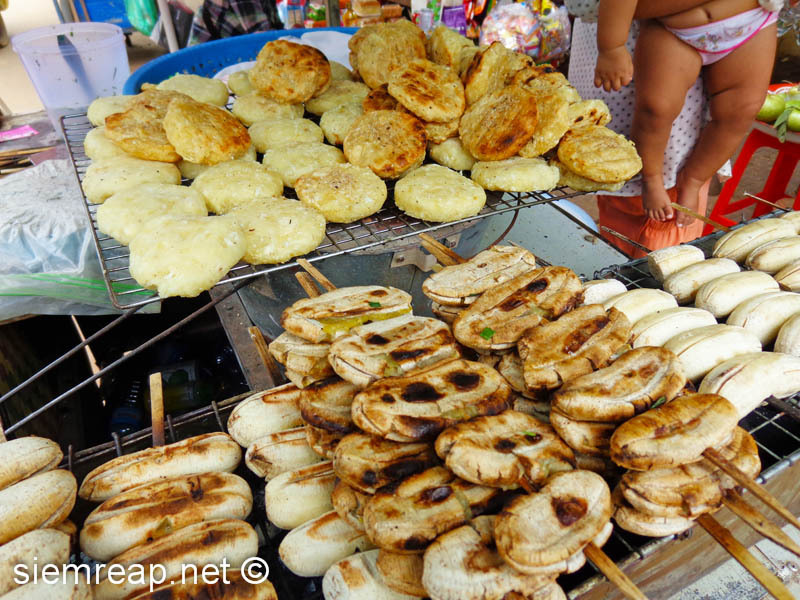 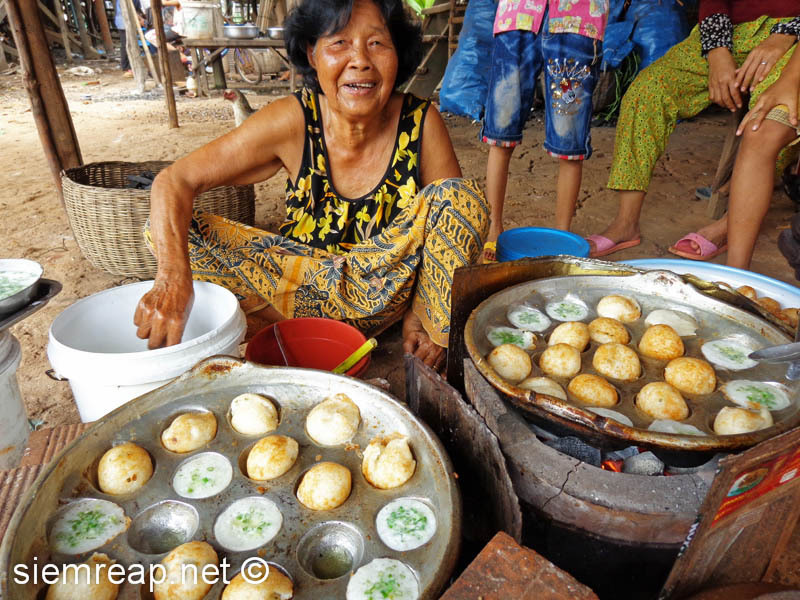 Cambodians call them “Noum Pom” and prepare them with coconut milk… 500 Riels a piece! 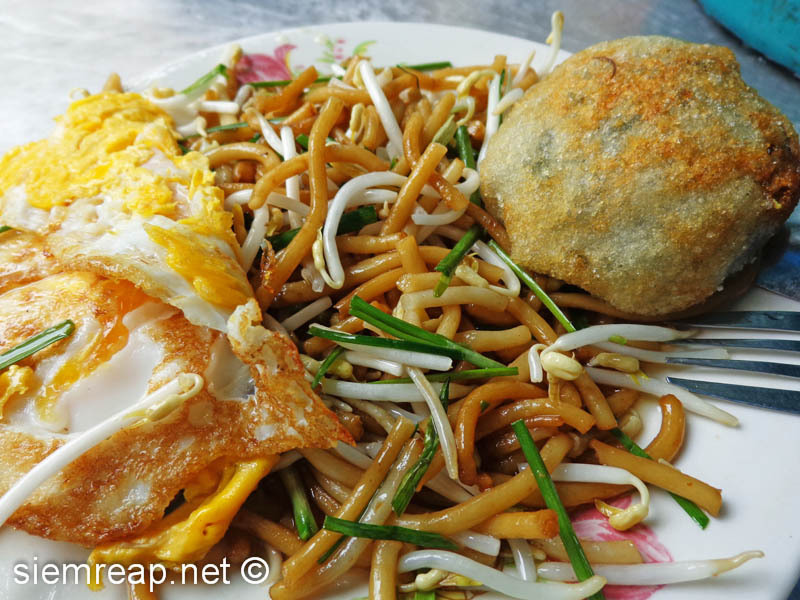 Fried noodles (“Lot tcha” in Khmer) served with a fried duck egg (“Pong tir tchirn”) and a vegetable fritter (“Noum katchay”), for 2500 Riel. 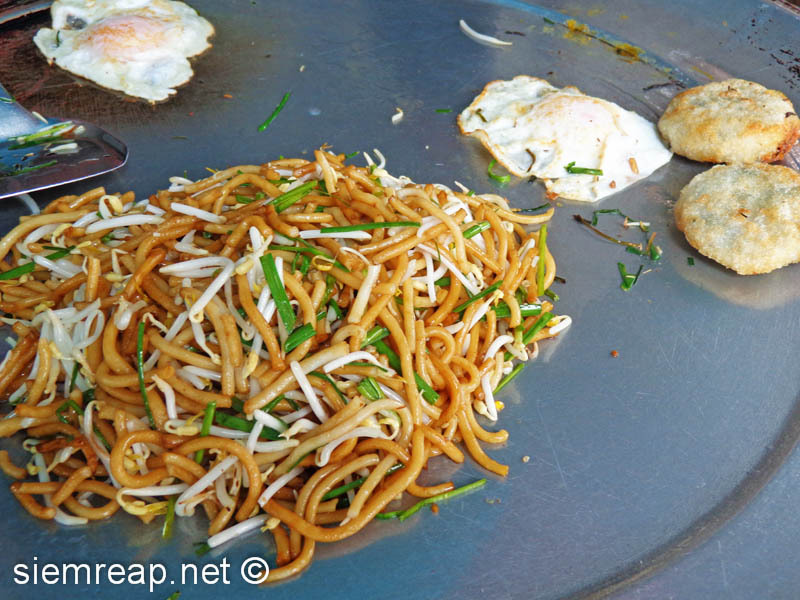 These noodles are made from rice and their specific name is due to their short length, fried noodles are normally called “Mee tcha”. 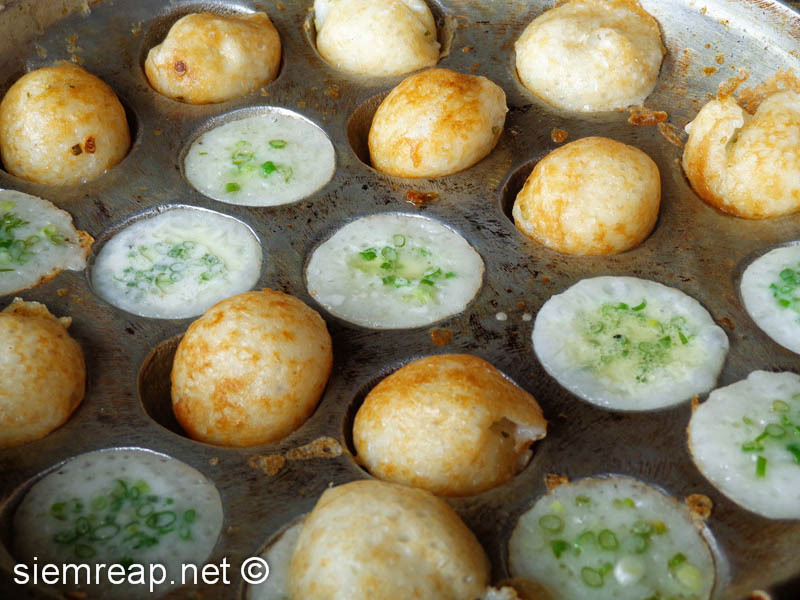 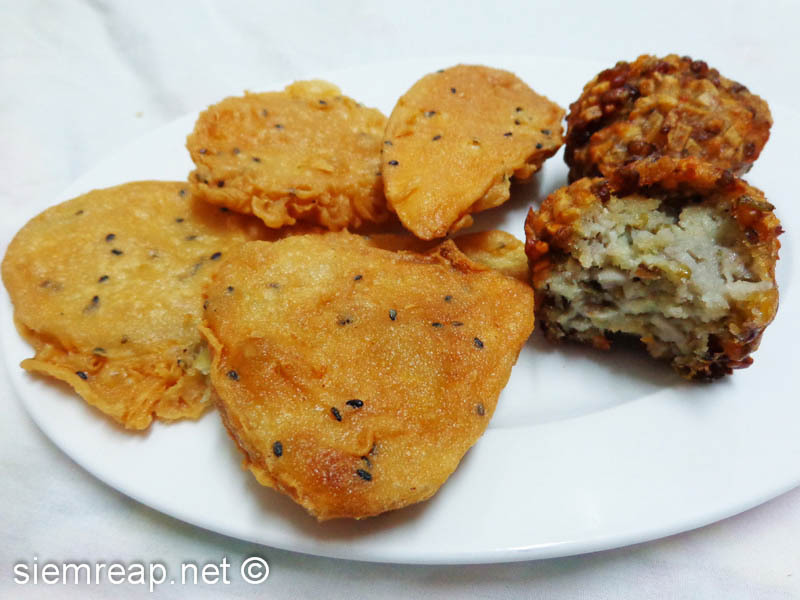 Another version of “Noum Tcheung Tchrou”, the tasty fritters made out of soybeans that you can purchase for 500 Riel a piece.